Hardly anyone uses Orange BorX O Fire around here. Most people on the West Coast use Red, Pink or Natural BorX O Fire to cure eggs. However, in the last few years orange has become my go-to bait. To perfect that bait further I’ve become accustom to mixing the orange and the natural and believe I’ve found the perfect egg for coastal steelhead. The main reason why I use the orange is because when I fly fish with beads I (and the steelhead) really like the orange beads. Mixing the orange and natural create an egg that’s identical to that bead. When that cured egg drifts underwater it looks natural to the fish and attractive to me, which means I have confidence in it. I know it works because it gets bit many times daily on my guided trips. Mixing cures is easy to do. I mix the two cures because the orange by itself is too strong; therefore I bring in the natural to tone it down a bit. I use the Borx O Fire because it toughens the egg and gives it a leather-like durability to rather than a wet, runny egg that a sulfite cure would create. For steelhead, I like a gummy, durable and leathery egg. And, while many anglers don’t, I dry them out for a long time because I don’t want them to dissolve quickly in the water. While this process might sound lengthy it easier than you think. Let’s focus on making a great egg that works in all coastal systems. Lay out the skeins on a paper towel. Cut the skeins down the middle so there’s two equal halves. Once I get my two equal halves I’ll cut them in half them again or leave them as they are and then cut them a little bit larger than bait-size pieces. I cut them to reflect whatever size is necessary for the watercolor and body of water I’m fishing. I do this prior to curing them so they are ready to fish when I’m done with the curing process. I pre-mix the cure in a Ziploc. I start with natural and pour it into a Ziploc. I’ll use half a bottle for four skeins. Then I take orange (and if I’m using half a bottle of natural) and pour a quarter bottle. Then I add sugar. I pour enough sugar to match the amount of cure that I poured in the bag. I think steelhead like a sweet egg. People might think this is a lot of sugar, but it works. I use it everyday. 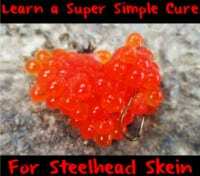 I believe it also helps make the egg gummier and stickier, which allows you to fish longer with the same bait. Mix the bag of cure thoroughly. It’s important that the contents mesh together. Take pieces of skeins and place them in a Ziploc. I start with two skeins and sprinkle the cure (that was mixed in the bag) over the top of the skeins. Then close the bag and mix it up. Repeat this step until all your skeins are in the bag. I add several squirts of Liquid Krill as I believe it adds more scent to the eggs. Let the cure sit in the bag for one-to-three days. You’ll know they’re done when there’s no more juice in the bag. Once the eggs are done curing I dry them. To accomplish this I lay them on a screen box. The screen box helps them dry from both sides. If you try to dry them on paper towels you’ll have to flip them over multiple times to ensure both sides dry. Temperature depends on how long you leave them out. If it’s colder you leave them out longer to dry. If it’s hotter there’s a shorter dry time. I like to dry them because they fish longer when they are dry. You’ll get more drifts out of the egg than if you don’t dry them. I swing my bait a lot and if I didn’t dry them out it would last one-to-two drifts. If you dry them out you’ll get double that. Editor’s Note: Rye Phillips operates Fishing With Rye. 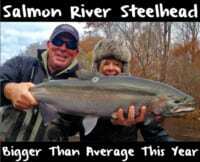 For more information on his guided coastal steelhead trips please visit www.fishingwithrye.com.